Fruits Salad or Cut fruits with Nuts are an excellent source of nutrients for Kids during summer season. 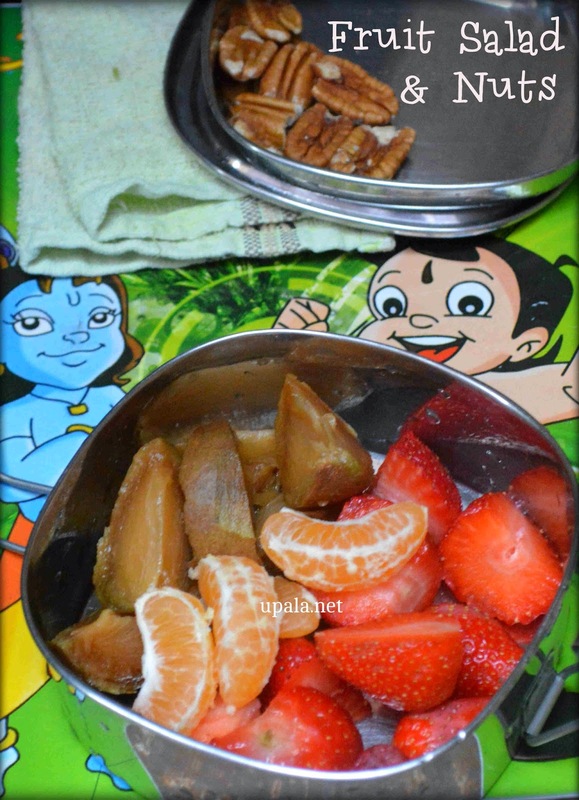 This fruits salad is best suited for Kindergarten kids who go to school for 3-4 hours. Mostly the Lunch box never turns empty when they return home but if you give them colourful fruits I am sure they love their snack time. You can also pack fruits and nuts in addition to their Lunch box for older ones too. Here I have packed Chikoo, Orange and Strawberries with some pecans. You can pack any of the fruits as per your child's taste. Adding Honey enhances the taste of fruits also some might prefer adding fresh cream, add them or serve plain as per your child's taste. 1) Kids get bored easily so never pack the fruits the next day too give 2-3 days gap. If your kids love fruits and demands you to pack them for lunch box every day, you can pack fruits next day too but make sure not to repeat the same set of fruits. 2) Make sure to remove seeds and skin (if needed) for required fruits. 3) Some fruits and nuts have choking hazard while eaten in a hurry so make sure to chop them to small pieces or avoid them for Lunch box so that your kids feel comfortable while eating. If you don't prefer to add whole nuts, try making a dry nuts powder and sprinkle on fruits or switch to raisins. 4) Before sending fruits to school in Lunch box, make a habit for your kids to eat fruits regularly at home under your guidance. This will help them to learn how to eat fruits and feel comfortable in eating them at school. 5) I have packed only 3 fruits but you can also add more fruits according to your kid's choice.